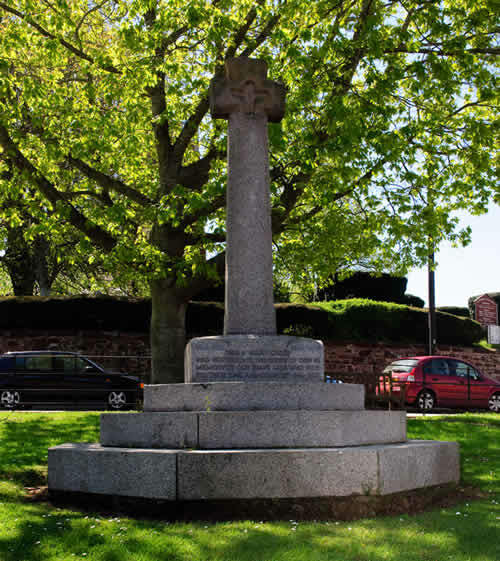 There are no names on the memorial cross which stands in a prominent position outside the church at a busy road junction. Inside the church is a War Memorial tablet with names. 10174 Private Frederick Kenry Buckingham of the 8th Battalion, the Devonshire Regiment. Son of Fred and Maud Buckingham. Born in Honiton in the June Quarter of 1886. Died 25 September 1915 aged 29. 82280 Private Leopold Cann of the Machine Gun Corps Infantry, formerly 5533 of the Duke of Cornwall's Light Infantry. Son of Annie Cann (widow). Born in Alphington in 1890. Died 28 April 1917 aged 27. SP/2946 Private Richard James Carpenter of the 24th battalion, the Royal Fusiliers (City of London Battalion). Son of William and Louisa Carpenter. Born in Alphington in 1896. Died 31 July 1916 aged 20. 16347 Private Albert Conway of the 2nd Battalion, the Devonshire Regiment. Son of Charles and Emily Conway. Born in Whimple in 1898. Died 1 August 1917 aged 19. 4087 Acting Corporal William Henry Counter of the 4th (Reserve Territoiral) Battalion, the Devonshire Regiment. Son of James and Betsy Counter. Born in Alphington in 1882. Died at home 28 October 1916 aged 34. Buried in the extension cemetery of Alphington (St Michael) Church. 184419 Gunner Joseph Charles Henry Edgecombe of the Royal Indian Marines. Son of Samuel and Charlotte Edgecombe. Born in Alphington 17 December 1879. Died of illness 27 September 1917. Buried in the extension cemetery of Alphington (St Michael) Church. Captain Hugh Robert Evans RN (retired) of Belvoir House, Alphington. Born in St Albans in 1853, he first joined the Royal Navy 2 May 1866 and eventually became a lieutenant on HMS Black Prince. In 1897, he married Esther Louiusa Jackson of Plymouth who was then aged 20. The couple lived at first in Penzance then came with their first 3 children to live in Alphington around 1902. A further daughter and two sons were born to them between then and 1911. Hugh Evans became a sidesman at the church and by 1912 he was a JP in Exeter. But immediately war broke out he sought active service at the age of 61. Sadly we can find almost nothing of him after this point - can you help? 54314 Private Ephraim George Hambly of the 9th Battalion, the Royal Welsh Fusiliers; formerly 50907 of the Welsh Regiment. Born in Bideford in the June Quarter of 1890. Died 20 October 1918 aged 28. 176920 Gunner Ernest Robert Hamilton. Son of John and Louisa. Born in Exwick in the December Quarter of 1873. Died 28 October 1918 aged 45. 345254 Private Albert John Leach of the 16th Royal Devon Yeomanry Battalion, the Devonshire Regiment. Son of David and Lucy Leach of Lower Shillingford. Born in Alphington in the March Quarter of 1897. Died 3 December 1917 aged 20. 30577 Acting Corporal (Frederick) John Loram of the 1st Battalion, the Devonshire Regiment. Son of Edmund and Alice Loram. Born in Alphington in the March Quarter of 1893. Died 4 October 1917 aged 24. 2nd Lieutenant the Australian Flying Corps, 3rd Squadron. Son of Arthur and Clara Loram. Born in Sheldon in the March Quarter of 1893. Died 15 June 1918 aged 25. Lieutenant Claude de Neufville Lucas of the Royal Navy, HMS Indefatigable. Son of Lt. Col. Henry Frank E. Lucas and Kate Alman Lucas. Stepson of Florence Lucas. Born in Dunchideock in the December Quarter of 1892. Died 31 May 1916 aged 23 in the Battle of Jutland.. Lieutenant Harold Clement Montagne Lucas of the 2nd Ghurkas, King Edward's Own. Son of Lt. Col. Henry Frank E.Lucas and Kate Alman Lucas; brother of Claude (above) Born in Hereford in 1886. Died 2 November 1914 aged 38. Driver John Bartholomew Lucas of the 238th H T Company, the Royal Army Service Corps Son of Frank and Francis Lucas. Born in Dunsford in 1893. Died 20 December 1918 aged 26. 2413 Private Samuel Mitchell of the 1st/4th Battalion, the Devonshire Regiment. Son of Richard and Elizabeth Mitchell; brother of William (see below). Born in Hennock in 1885. Died 29 September 1916 aged 31. 5390 Private William Henry Mitchell of the 1st Battalion, the Devonshhire Regiment. Son of Richard and Elizabeth Mitchell of Red Lion Cottages; husband of Flossie Mitchell; brother of Samuel (see above) Born in Hennock in the June Quarter of 1882. Died 30 October 1914 aged 32. 16355 Marine George T. Milton of the 2nd Royal Marine Battalion, RND, RMLI. Son of Thomas and Elizabeth Milron. Born in Alphington in 1896. Died 26 October 1917 aged 21. O/644 Lance Sergeant Charles Paddon of 70 Company, the Royal Army Ordnance Corps. Son of Jane Langworthy of Devonia Terrace. Born in Exeter in 1879. Died 30 December 1917 aged 38. Buried in Alphington Church Cemetery. 199190 Petty Officer James Richard Rowe of the Royal Navy, HMS Monmouth. Husband of Miriam Rowe. Born in Buckland Monachorum in 1872. Died 1 November 1914 aged 32. (NB: 1st name incorrect) 1850599 Musician Henry Louis Selley of the Band of the Royal Eningeers. Son of Robert and Mary Ann Selley; husband of Constance Selley. Born in Alphington in 1876. Died 26 May 1921 aged 45. Buried in the churchyard at Gillingham, Kent. Served 24 years with the Band,. 38593 Private William John Shepherd of the 4th Battalion, the Worcestershire Regiment. Husband of Alice Shepherd of Matford Cottage. Born in Exeter in 1883. Died 18 April 1918 aged 23. Major Henry Bingham Whistler Smith-Rewse of the Royal Horse and Royal Field Artillery. Son of Major Henry and Florence Smith-Rewse; brother of Meyrick (see below). Born in the Esat Indies in 1877. .Died 21 November 1914 aged 37. Lieutenant Meyrick Bingham Whistler Smith-Rewse of the 8th Battalion, the Canadian Infantry (Manitoba Regiment). Son of Major Henry and Florence Smith-Rewse; brother of Henry (see above) Born in Rochester, Kent in 1888. Died 22 May 1915 aged 27. 45288 Lance Corporal William Ernest Stephens of the 2nd battalion, the Royal Berkshire Regiment. Son of George and Elizabeth Stephens of Matford Cottage. Born in Dawlish in 1894. Died 23 September 1918 aged 23. J 28127 Boy 1st Class MichaelL Leonard West, of the Royal Navy, HMS Viknov. Son of William and Bessie West of Sexton Cottage; brother of William (see below) Born in Alphington 23 January 1897. Died 13 January 1915 when his ship sank. 16602 Private William Henry West of the 1st Battalion the Devonshire Regiment. Son of William and Bessie West of Sexton Cottage; brother of Michael (see above). Born in Alphington in 1895. Died 25 September 1918 aged 23. SE/32255 Private Frederick John Westcott of the Royal Army Veterinary Corps. Son of George and Kate Westcott of Caroline Place. Born in Alphington in the December Quarter of 1896. Died at home 25 November 1917 aged 21.